Napa Valley is a gourmet paradise. From the fabulous wineries to one of the best American restaurants to the freshest farm to table recipes this is an orgasmic foodie part of the world. 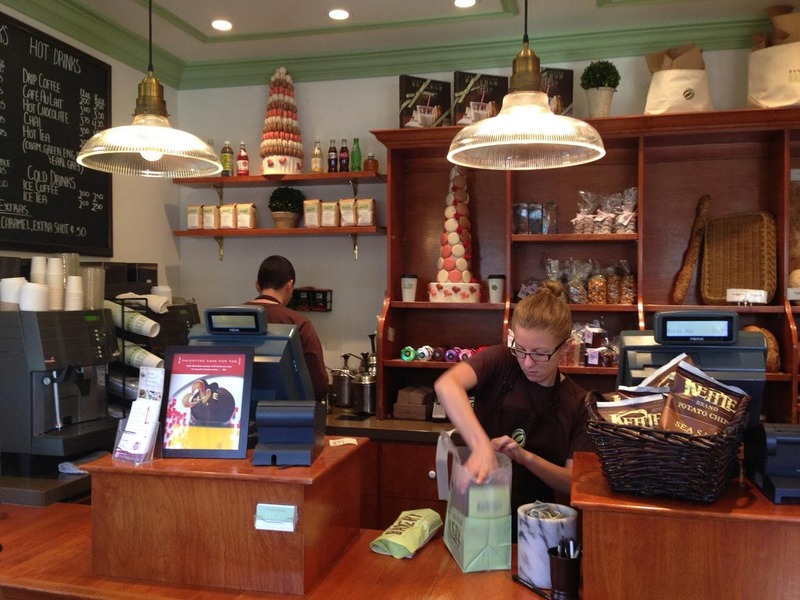 One of the most famous destinations is Bouchon Bakery. The Napa Valley outpost of Thomas Keller Group’s bakery brand is a weekend pilgrimage outlet. Thomas Keller is the only American-born chef to hold more than one 3-Michelin star restaurant among which is The French Laundry, the permanently-booked Yountville fine dining restaurant. He has been awarded numerous accolades, has been recognized best chef in America and granted life-long achievement awards by various publications and associations. He currently holds 7 Michelin Stars in all his restaurants. He has also written several recipe books and established a long-list of collaborations with other brands in the hospitality and food industry. At the time of my visit The French Laundry was closed for refurbishment. Not that I would have managed to get any booking without several months of planning or the help of a concierge service. Bouchon was as close to the Maverick chef as I could get. And I love a great buttery croissant so I don’t usually need much of an excuse to visit a bakery. 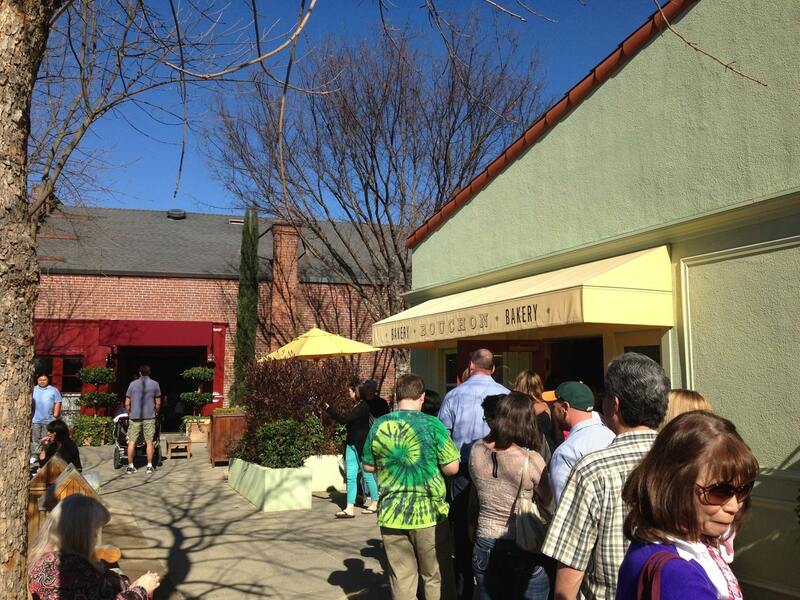 We head to Yountville in the morning and by the time we get there, at around 9,30am, the queues is already snaking outside of the tiny store. It is a warm winter day in the Napa and locals and visitors alike have poured into the streets for a walk, a relaxing morning or a trip to the bakery to stock up. I have never seen so many people queuing for bread, pastries and cakes. My expectations build up after the close to 45min wait. When we finally make it inside I realize the store is very small and consisting only of an L-shape counter displaying all the delicacies and little space for the waiting customers. From the outside, the green and lemon yellow sign is warm and simple, reminiscent of any bakery back in Europe. There are a few high tables and stools by the side of the building, in front of the exit door to enjoy your purchases but most people come for take-away. By the time they get back home the family will have starved or proceeded to open the cereal boxes. Since the space is so compact it is hard not to miss anything and once you get inside you are almost immediately asked to place your order. You can of course take your time but the pressure of the queue behind you is a reminder to keep moving. The staff is friendly, not pushy and patient enough. I bet they want to strangle more than one customer every day. Behind the counter they are constantly walking over each other as they follow the constant stream of customers on their journey from right to left, from the entrance to the exit. We are given our purchases in proper wrapping in boxes and paper bags depending on what we order, to ensure it does not get damaged in transit. The staff answer all the questions even though they must be repeating the same a hundred times every day. On one extreme of the counter there are the room temperature buttery pastries. 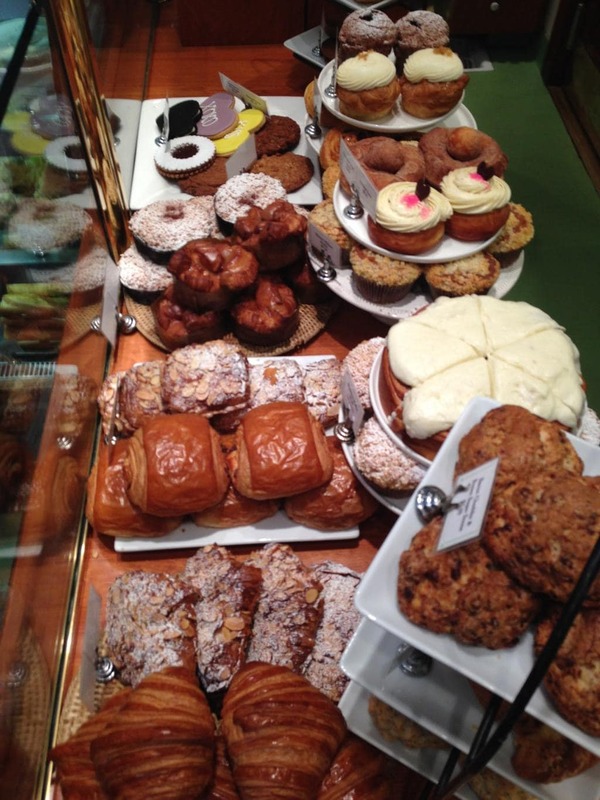 From muffins to croissants and other typically French goodies. They have cookies, scones and spirals in all flavors. These are not the regular middle of the road pastries, even on the harder-to-excel corner, the range is somewhat advanced. The donuts have icing or no hole at all and the sugar is cinnamon flavored. To the middle, the fridge holds a variety of individual tarts, cupcakes and cakes. 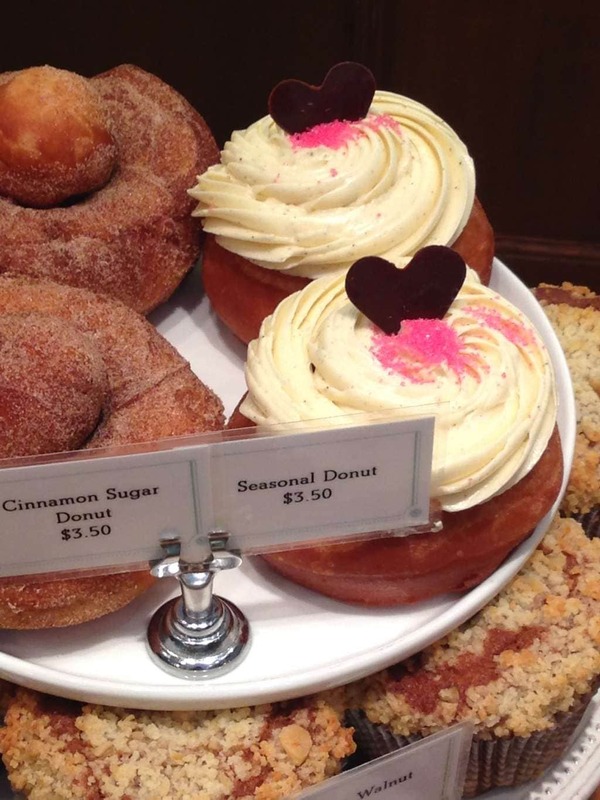 It is Valentines Day weekend so there is a wide range of pink and heart-shaped sweets. There are also macaroons in all colors and fillings. And eclairs. Bread seems to take a remarkably secondary place and it barely features. 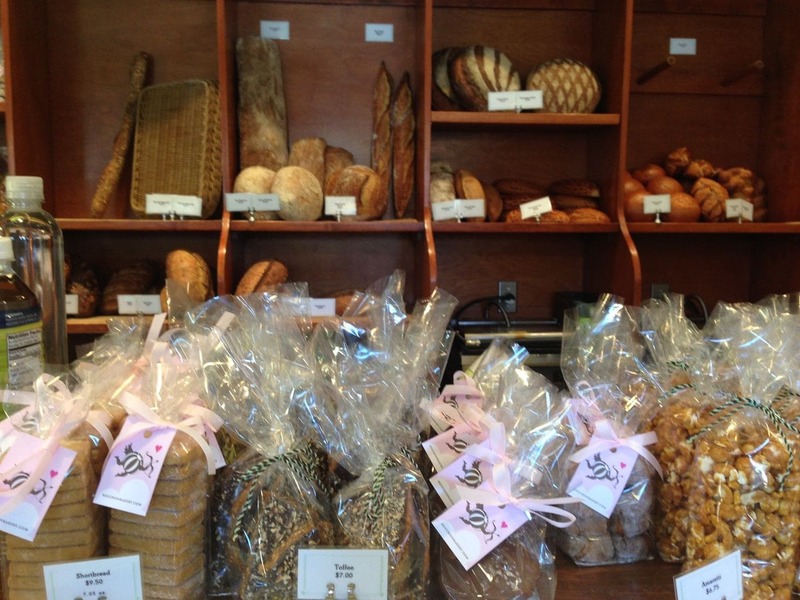 The various breads and loaves are showcased behind the staff, as in most bakeries, but there are only a couple of each. As we waited so long we feel like we should try a few options so we go for the croissant, a cinnamon donut, an eclaire and a macaroon. 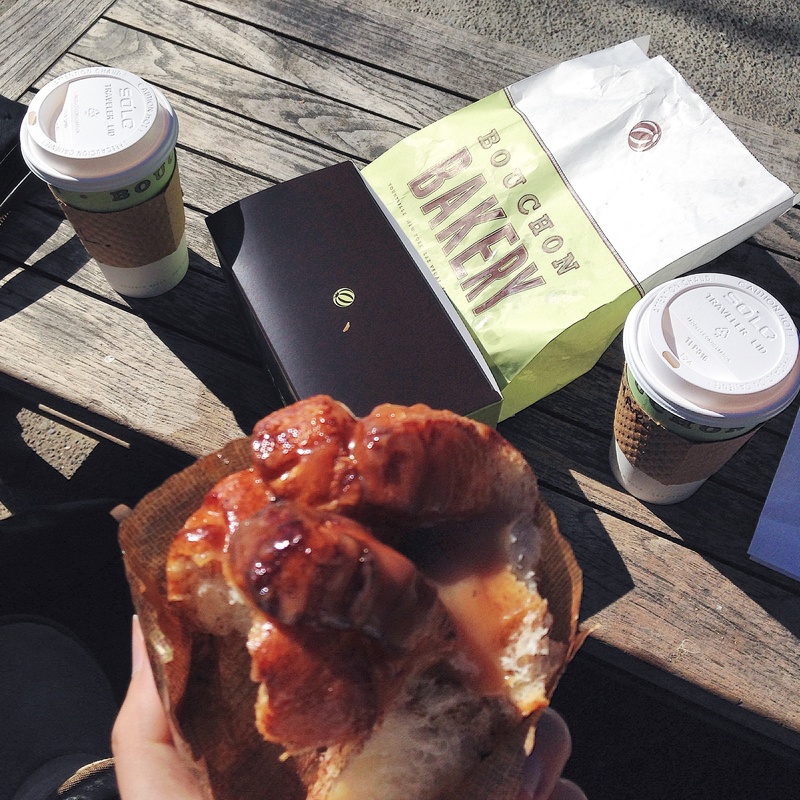 It’s breakfast time and we need a little coffee pick-me-up so we order two take-away lattes. In fact all items are to take away. The prices seemed steep in some cases but the usual level I pay back home on others. I live in Singapore though, where a croissant is a ludicrous $3,5. 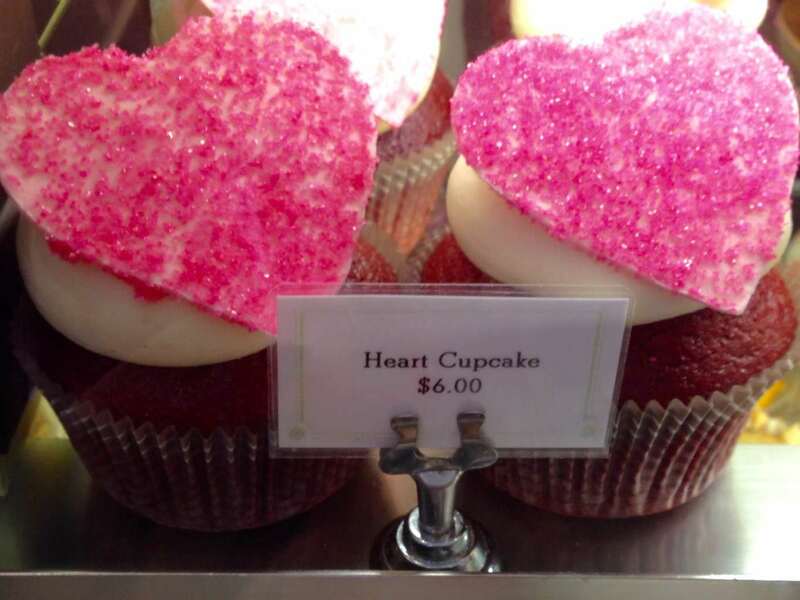 Cupcakes were $6, pastries $3,5, macaroons $3,5 and tarts between $6-8 each. But it all looked so pretty! Armed with our treasure we take a seat outside on some of the public benches that come with a tiny table. The sun is warm on our heads and the day is beautiful. Despite we have been there for 45min the queue does not seem to be decreasing. There is more and more people joining and instead of shorter it now seems longer. It could also be because it is Valentine’s day and locals are looking for something extra special that makes the wait worth it. In that setting, anything would taste great. We are in the mood for it, despite the wait. Impatient we open the bags and boxes and start savoring our goodies. I will caveat my verdict with one fact: I love croissants, I eat them almost every week and I am capable of hunting down bakeries until I find the right one. And that, in a humid country like Singapore, is an arduous task. 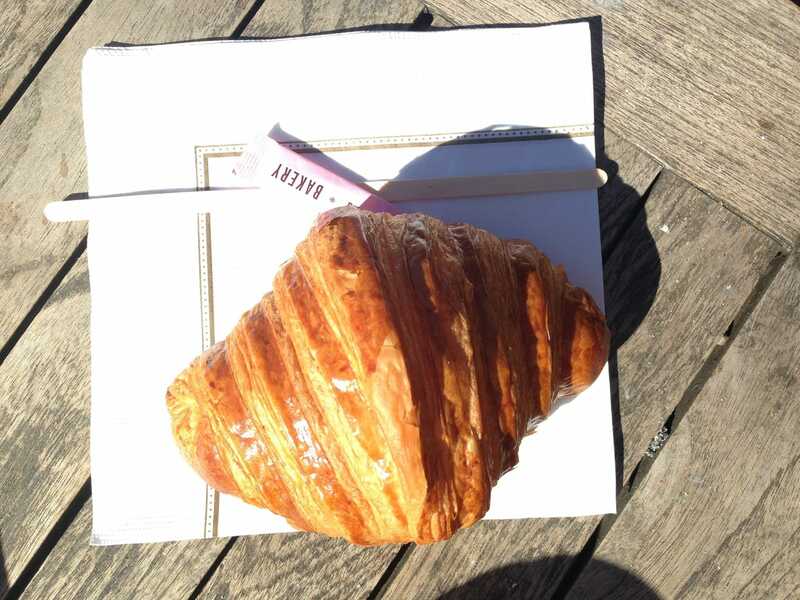 The croissant from Bouchon was nothing special. It was buttery but not as flaky as I would have expected. It was not perfection. The cinnamon donut was nice but, again, nothing to write home about. The same seemed to apply to the éclair which was nice but nothing so special. Lastly, as someone who owned a specialty coffee shop I am very picky about my coffee. The coffee at Bouchon was not great either. It was made by one of the instant machines, not the proper double-boiler espresso machines. It was too hot and the milk was burnt. For a little something extra in Napa, why not go on a hot air balloon. Find out how here.